Since Northwest Pilot Project was founded almost 50 years ago, Portland and the surrounding area has grown and prospered. Oregon is now one of the top five states for incoming residents. There are at least 30 cranes dotting the skyline in Multnomah County. But that prosperity has created, ironically, a misfortune for the elderly poor, who have been squeezed out of their apartments as property values rise. Displacement is especially difficult for older adults, and particularly for those with disabilities. In Oregon, a minimum wage worker ($10.75/hr) has to work 65 hours each week just to afford a 1 bedroom apartment at the fair market rate (FMR). That rate is now $904.00 per month. The average NWPP client can afford, on average, to pay only $392.00 per month. According to The National Low Income Housing Coalition Out of Reach 2018 report Oregon ranks 17th on the list of most expensive states in which to rent an apartment. Publish an inventory every few years of all affordable housing in downtown Portland to draw attention to the loss of affordable units over time. Urge preservation of all existing affordable buildings. Urge development of new affordable buildings. Urge 100% utilization of all existing Section 8 and public housing rental subsidies. Urge increasing the federal HUD budget to increase the amount of rental subsidies available. Urge building owners/property managers to keep rents as low as financially possible. Urge building owners/property managers to utilize flexible applicant admission criteria. Facilitate regular meetings of property managers and social service providers to create new partnerships and remove barriers to low income people obtaining apartments. Urge increase in financial assistance to low income applicants with application fees, security deposits, first month’s rent and other move-in costs. NWPP helps low-income seniors in Multnomah County navigate the course to permanent housing they can afford. Your support helps us provide housing search assistance, case management, short-term assistance, and moving costs. Click here to donate. Each of us can make a difference when we raise our voice. 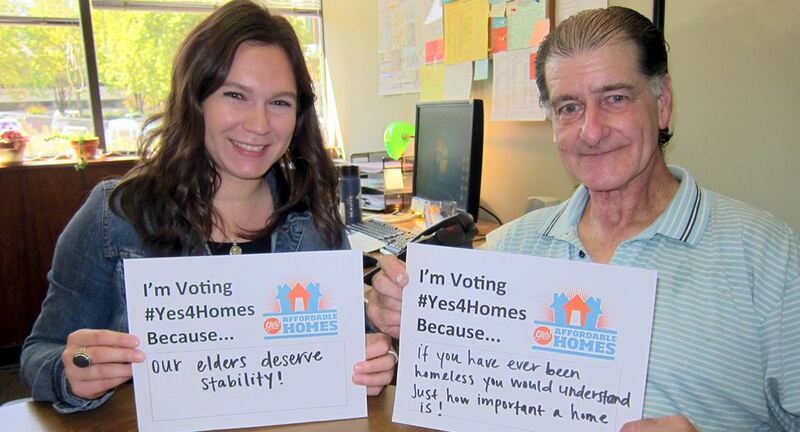 You can advocate for low-income seniors to have decent housing they can afford. Attend local government meetings – city council, county commissions – to learn what elected leaders in your community are doing about housing and homelessness.